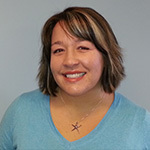 Bre Grabill | PLM Lake and Land Management Corp.
Bre Grabill began working for PLM in 2002 and is a graduate of Michigan State University with a Bachelor’s Degree is Environmental Studies and Applications. At MSU, Bre focused her studies on watershed management and limnology, studying water resources not only in Michigan but across the world in Antarctica. She currently works as our Northern Lakes Manager. Growing up on an inland lake in Newaygo County, Bre has a personal and professional interest in proper lake management, aquatic plant control and the environment. Bre’s division spreads over the entire Northern part of the Lower Peninsula and works directly with lake associations, residents, townships, and lake boards in managing their waterbodies on some of the largest lakes in the State of Michigan. Bre is actively involved with numerous organizations and in her spare time enjoys spending time with her family on the lake.